Let me give you an example. (If my kids read this they may roll their eyes and say, ‘This story again!’–Oh well!) For me, this story demonstrates both the questioning of God’s voice, (Are we being punished in these circumstances for my wrongs?) 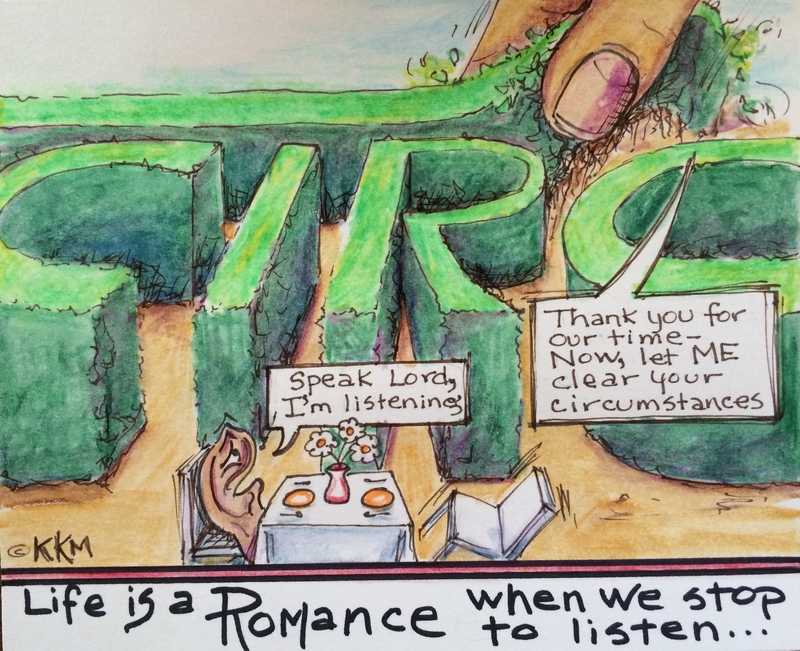 the time spent sharing with God our needs and taking time to listen (going about my day, continually placing the circumstance in His hands–having faith), and then the ROMANCE–His answer/deliverance. I was a single parent to two children, 20-some years ago, going to school full-time, working three part-time jobs and trying to manage a home on my own. At that point in my life a relationship with a man was NOT an option so I was on my own–but not–I had God (my Husband). He was ‘romancing’ me. Teaching me to see His love and care for me and my family. My part–trust Him. Late-fall, the light bulbs in our small, two-bedroom, furnished by donations from friends and strangers, rental house, were beginning to burn out. It seemed like every day we’d lose another. Finally, I was having to move light bulbs around so we’d be able to see. You’d think I’d just go buy some but I literally did not have the money. One morning, after the life of another bulb flickered and went out, I was on my knees, begging God (with tears and all) for some money for light bulbs, or to at least keep the bulbs we had shining! I could not see through my circumstance and the long, dark days of winter were coming. I left the house that morning wondering how this would all play out. To me, it looked impossible. Arriving home, I parked the car and went out to the mailbox. Sifting through the mail I found one of those unsolicited advertisements that clutter our counters and time. But this one, to me, was a miracle. It was an invitation to a grand opening of a Home Depot the following weekend. Everyone who brought their invitation to the store received a FREE package of light bulbs! The first thing that came to my head was, “Before you call, I will answer!” The second thing that came to my mind was the generosity of God–He even sent bulbs to light the whole neighborhood. It was the most romantic gift I could have received–I now knew, I wasn’t in that circumstance because He was punishing me. I was in that circumstance so He could show me I could trust Him to be my husband, my provider and my friend–The Light of my life. But wait! There’s more! The bags were full to the top with packages of light bulbs in every watt, size and shape and for every purpose–even the fridge and oven got new lights. I cannot describe the overwhelming love I felt at that moment from my heavenly Father/husband/friend. The mind-boggling juggling act of events involving businesses, ‘junk mail,’ donations and people in the right place at the right time, that God had already set into motion before I even asked Him for a light bulb is unfathomable–pure romance–not a mere occurrence. ← What Color is My Spirit?